Requirements for higher servomotor specifications and performance continue to evolve and critical aspects, such as accuracy and speed, become more and more crucial when it comes to improve efficiency, quality and productivity. Consequently, coupling technology must also progress and meet increasing demands. 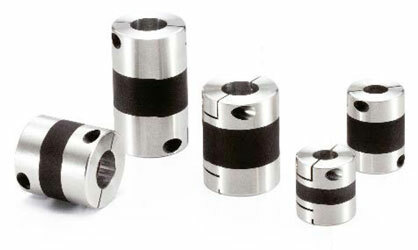 Couplings used in servo systems are often selected due to their static torsional stiffness and backlash-free features that are required by high precision and high speed applications in order to reduce the stabilization time (i.e. the delay between the command and the actual execution. For example, when the motor is commanded to stop and the moment it really comes to a stop). The higher the servomotor gain, the lower is the stabilization time. But on the other hand, excessive gain increases the occurrence of vibrations (aka “hunting”). Typically, users are accustomed to utilizing disc or bellows type couplings to raise the gain, but the use of highly rigid coupling causes hunting, so this solution may not be effective at all. XGT & XGS high-gain rubber (HNBR) couplings have been demonstrated through tests to be the perfect match with servomotors, stepping motors and actuators, as they can more effectively reduce the stabilization time and improve servomotor gain while suppressing hunting. XGT & XGS flexible couplings have a completely integrated structure (single-piece structure). XGT is the standard type model. Its width ranges between 23 mm and 60 mm (0.905” ÷ 2.362”) and the bore diameter at hubs is 3 mm to 25 mm (0.118” ÷ 0.984”). XGS is the short type model designed for space saving. Its width ranges between 18 mm and 40 mm (0.708” ÷ 1.575”) and the bore diameter at hubs is 3 mm to 20 mm (0.118” ÷ 0.787”). In both cases different bore diameters at hubs can be ordered. The allowable operating temperature is between -20°C to +80°C (-4°F +176°F).